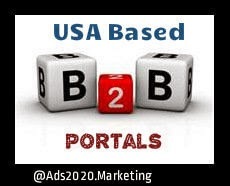 You are here: Home / B2B / B2B Trade Portals in USA- What B2B Website are Best Online Market Places in USA? USA Based B2B Websites – US Trade Portals for Exporters, Manufacturers, Suppliers, Sellers, Businessmen, Marketers, and entrepreneurs! Nowadays, the word ‘B2B Portals’ is being thrown around quite casually by corporate companies, online sellers, entrepreneurs, business owners and the likes. B2B (Business to Business) portals are being used by millions of online buyers and sellers around the world. They are great companies for doing trade online in international markets. The United States have been pioneer in this e-commerce sector where businessmen from different geographical areas do their business successfully over the Internet. B2B portals are great mediums for anyone looking for doing a business of small scale to large sized over the Internet. The sites offer great trading capabilities, in terms of buying selling features, product listings, customer support, transactions, promotion and exposure. In our series of popular B2B portals details, we decided to publish a general review about 5 to 20 top B2B trade portals based in the United States. But what exactly B2B Portals do it for you? If you are interested in promoting your own business online, but have no skills or prior experience in internet marketing sites, leaving your concerns to an expert that lists your services and arranges advertising campaigns so that you can achieve the widest audience for your business. For this reason, your safest option is to engage the services of a popular trade portal for showcasing your range of products. What are Trade Portals and How They Work? #1. Basically, a B2B portal is like an enormous phone book- it has a comprehensive list of clients, customers, online sellers for large corporations, and various small companies that are engaged in buying or selling their products and wares. #2. Trade portals serve as a useful stage for describing their businesses, displaying their merchandise and listing prices, and giving out contact details to all those who are interested in business transactions. #3. A B2B portal generally bridges the client-customer communication void by setting up an interactive background where they can set up shop and conduct their buying or selling activities, placing orders in bulk to other companies and also tending to customer’s inquiries and complaints –and all of this housed under one single, convenient roof. Below is a list some of the best B2B marketplace websites operating from the United States that are famous for their productivity and sales revenue, search and navigation, customer support and product exposure in the USA. They work by grouping business companies under a broad selection of subjects according to the kind of services and products- industrial machines, chemicals or dyes; medical equipment; lifestyle and clothing; daily necessities; food and drink; electronic goods and others of the ilk. Each of these sections comprises of a huge list of sub-categories focusing on a certain type business activity that falls under the broader heading. Inside each subheading, all the business companies that deal with such activities are grouped together with a memo of their products, discounts and sales, maintenance as well as their contact information which can be instantly accessed by anyone from anywhere. This B2B belongs to Staples, the second highest grossing commercial website for online sellers or buyers both. It has a comprehensive trade plan that is based on client hierarchy, customized search tools, and efficient business solutions. The clients or business owners are directed to their chosen area of products in an interactive way where they use a filter to specify what their chosen items are. They include an advanced search and navigation box that allows business owners to enter their search string in the form of an item or a code number for machine parts or models, giving them the most likely results in only one or two searches. They have received worldwide acclaim for their superior approach to search and navigation for items and services, with predictive menus to shorten time and effort. Also, the product detail pages contain a full list of specs, as well as images of the article from all possible angles, model name and number, and detailed contact information to settle queries on every point. This is one of the best websites in the USA for its influence in the industrial goods department. A powerhouse of sales and customer support personnel and well as a good standing with the topmost industrial companies and manufactures in the United States has definitely garnered ThomasNet its fair share of the public eye.They have great search and navigation tools such as McMaster or Fastenal which are tailored specifically to suit the needs of their customers. The product page mentions the ways in which their services can be accessed by providing information on the product itself including the name of the manufacturer, model number, images that can be zoomed, as well as offers attached with the item. This is a real rags to riches story. Fastenal has gone from a chain of barely known hardware business owners in small-town USA to a vast worldwide supplier for industrial and machinery parts that receives orders from the most influential B2B industrial magnates in the United States. Replete with resources and filters that conduct time-saving and efficient searches, Fastener asks for horizontal modifications in place of vertical so that maximum space can be occupied by the screen. 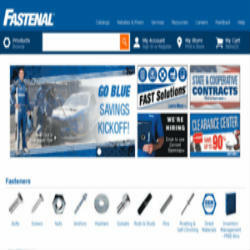 Fastenal B2B Company has well over 2,500 branches throughout the United States, Canada, Mexico and Europe. They have more than 12 distribution centers across these locations. This B2B is brilliant for its reliability to provide instantaneous results to all customers and online sellers, and employs a state-of-the-art navigation tool. Its popularity among customers of every class and background is owed to the quick responses and customized shopping carts with notifications added as soon as the client places the items on the cart. The company supplies manufacturing plants and large commercial facilities worldwide. It has more than 500,000 products listed on their B2B portal. What are the Business Advantages of trading on these USA based B2B websites? 1. B2Bs can be likened to toughened business heads in that they’re extremely proficient in gauging the popularity of a certain line of business through close analysis of current market conditions to determine how much popularity a certain item is going to. 2. Once you get yourself registered with a popular trade portal, you’ll find yourself completely immersed in a plethora of opportunities to bring popular attention to your company. 3. Those who’ve been previously registered can place request for affiliates to endorse their companies with attractive commission offers, participate in online auctions for gaining control over certain franchises, hold interactive games during launch week, grab attention through awesome introductory product prices and other similar activities. 4. A vast array of features and special techniques is made available to registered users and that are often indispensable to entrepreneurs, online sellers and business owners just starting off. Tools to track the progress of purchases, management of accounts and finances, provision for detailed searches about an item and comparing similar brands is just a few examples of these. 5. B2Bs have the advantage of being able to infuse the branch stores of a business into a single unit for efficient communication and overseeing the exchange of items, products and other services to online sellers with no room for confusion. 6. If you are experiencing difficulties in promotion and advertising, there are separate sections that will cater to you, in the form of in-depth business discussions and find effective solutions to your problems that fit with the particular demands of your company.